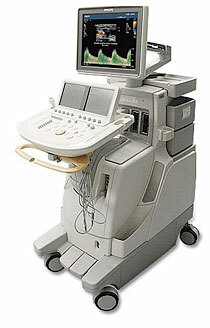 Ultrasound is sound composed of frequencies in excess of 20,000 Hertz (20 kHz). Ultrasound falls outside the range of normal human hearing ability. Modern ultrasounds have the ability to acquire images in 3D & 4D. Types of ultrasounds include shared service machines, portable notebooks and handheld ultrasounds. Calculations or software are organ-specific to individual echo procedures. Non-destructive testing (NDT) and non-destructive evaluation (NDE) of materials. One of the most notable applications is in sonograms, which have particular effectiveness in the pro-life movement; after seeing their unborn child(ren) insider of her, about 80% of women considering having an abortion change their mind and carry the child(ren) to term (not surprisingly sonograms are rarely if ever found inside Planned Parenthood clinics).